I was recently consulted for my point of view on the state of microblogging and in particular, Tumblr’s prospects. Since its acquisition two years ago by Yahoo, it hasn’t been able to break out in a more mainstream way to become part of the consumer lifestyle the way Instagram, Snapchat, Facebook and Twitter have. At first, I thought it was because Tumblr content is unusually niche, with the best blogs covering very specific topics. That kind of content takes a lot of dedication and creativity to sustain, which is a pretty high bar. Contrast that with something like Instagram where the app itself a) helps make the content look great and b) has a very large built-in audience of 400M, and it’s easy to see why Tumblr is falling behind. Lastly, when you look at Tumblr user behavior, I would reckon that over 90% of it is re-blogged and not original. There’s nothing wrong with that per se. Afterall, that’s what Pinterest is all about. My next thought was that it was Yahoo!’s fault, that somehow the parent company changed things for the worse. From what I can tell, Yahoo! has kept the Tumblr platform fairly intact and has exposed the best Tumblr content onto the broader Yahoo! platform, including food and travel related pieces — all good things. But then as I reached for my phone to look at a notification, I realized it had to do with mobile behavior. Mobile is all about what’s happening just now. Tumblr is the opposite of that. Its content has a very long shelf life and isn’t a real-time platform the way Twitter or Instagram are. If you don’t check Twitter for a couple of days, you’ve missed a ton of content (for better or for worse), and you’ll need to catch up or just go with the flow. But on Tumblr, there’s no such urgency. You can open up the Tumblr app or site and just leisurely scroll infinitely. While Twitter posts are usually of-the-moment, Tumblr content typically has longevity. So, there’s simply no urgency to check Tumblr as frequently as you would Snapchat, Twitter or Instagram. 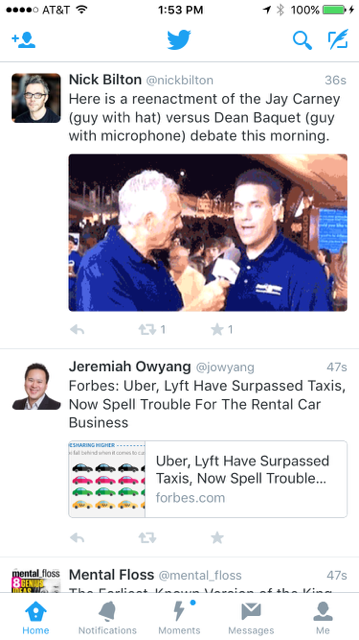 Twitter’s real-time content feed provides users with a non-stop stream of new content. The new Moments feature provides a richer way of accessing trending content that is easier for new users to digest. Instagram started off as a network for people to create professional-looking images and easily share them. The original iterations of the app didn’t allow access to previously store images, creating a “I shot this right now” behavior that still exists today. And up until recently, it lacked infinite scrolling. So, if you didn’t check your feed at least once/day, you wouldn’t be able to see what your friends were up to. Instagram cleverly deployed the “FOMO” phenomenon to encourage to check the app dozens of times a day. 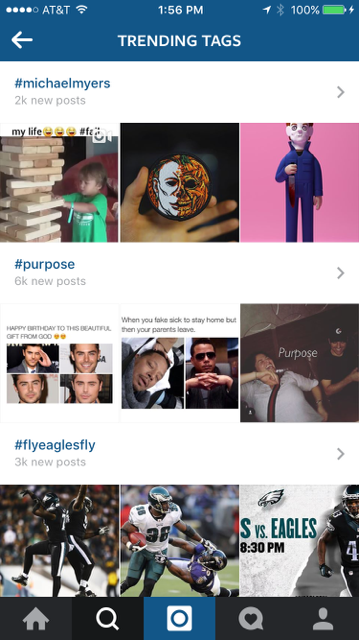 Instagram does a solid job organizing fresh content around hashtags, making it easy to see coverage of topics or events at a glance. 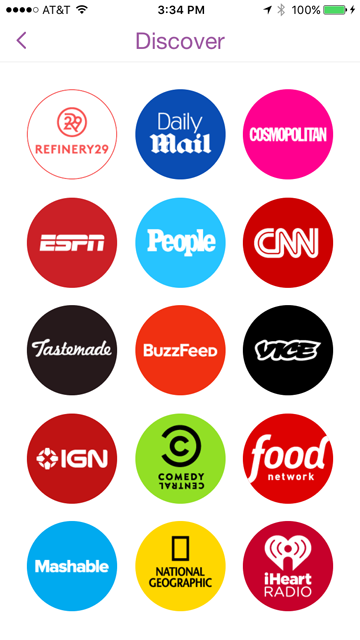 Snapchat takes a different but equally successful tack to build timeliness into their content. Personal Snaps disappear. And Stories only last 24 hours before they expire. So where does that leave Tumblr? On paper, its mobile app has everything it needs to be successful. But it needs to introduce a new behavior or feature that builds urgency into its content. It could be through an interface on the app or encouraging new user behavior. Tumblr has no shortage of passionate users or great content. But that’s not sufficient when there are so many other ways to create mobile content right here, right now.